Successfully Added Cross Camera - Ultimate Hidden Digital Camcorder to your Shopping Cart. A wearable camera never looked so good. Not only is this baby a camera and camcorder, it's a darn good camera and camcorder! Captured videos are clean, bright, and even come with audio! VGA quality, 30 frames per second, XVID AVI video makes The Cross Camera one smoking hot gadget! Buy them today and we'll express ship it out tomorrow. Brought to you by the leaders in online direct from China wholesale electronics and dropshipping - Chinavasion. 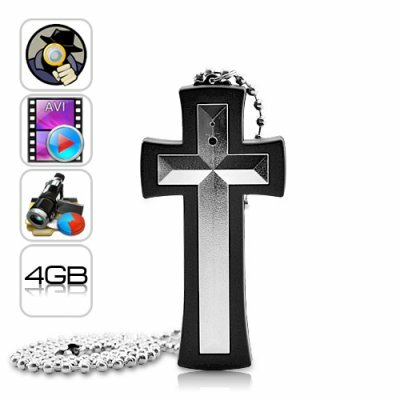 Comes with everything you need including a necklace so you can wear this cross camera pendant right out of the box! 4GB memory is able to store over 2 hours of high quality video!